So far we are having a lovely time in Kansas City! It is much more beautiful than I was expecting and we are having so much fun with Fabian’s sister and brother-in-law. Thanks to everyone who has given their recommendations for dining and sightseeing in KC. We are about to head over to the Nelson-Atkins Museum, but I thought I would leave you with a fabulous room to enjoy. I hope everyone has a fabulous Fourth of July weekend! 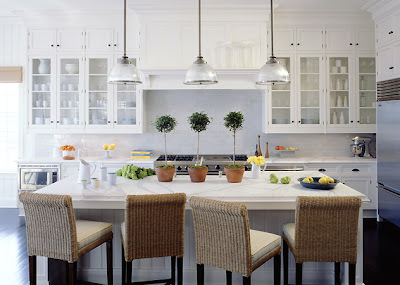 This kitchen by Nathan Egan Interiors has been on my list of favorites for quite some time. 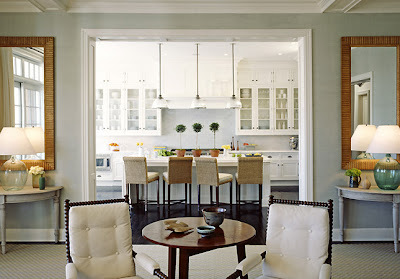 I love the classic look and casual, elegant feel of the room as a whole. It would be fantastic at any time of the year, but it does have a very summery feel in my opinion. A view into the kitchen from the family room. 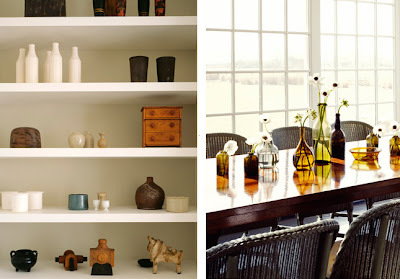 I love the demi-lune tables and demijohn lamps. I love the abundance of light that pours through the gorgeous windows. I also love the seating used in this room. So pretty! Oh, you have such a good eye! Love the natural lighting in this lovely space! I would love to see more of this house! Great pictures! Glad to hear your are having a fabulous time!